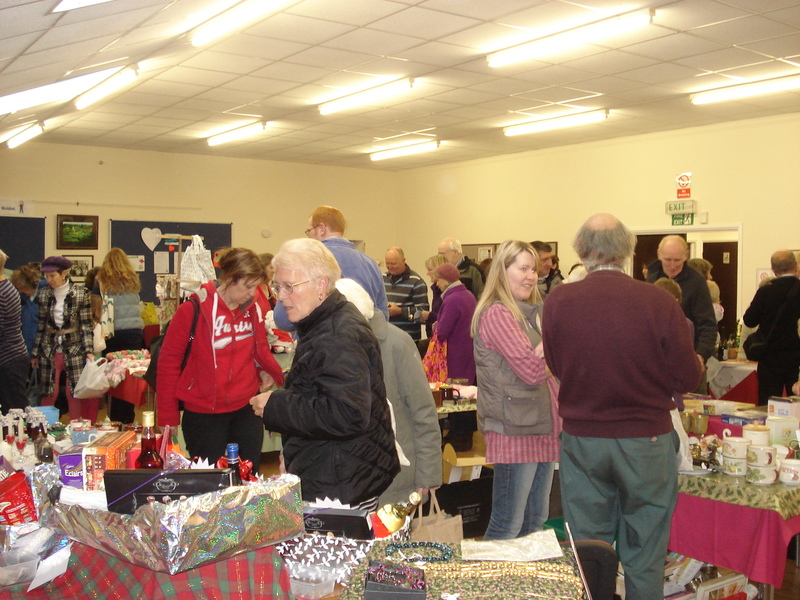 Today was Buckland St Mary’s Christmas Bazaar. Like last year we were on the Bric a Brac stall, basically selling other people’s junk, or their unwanted gifts. 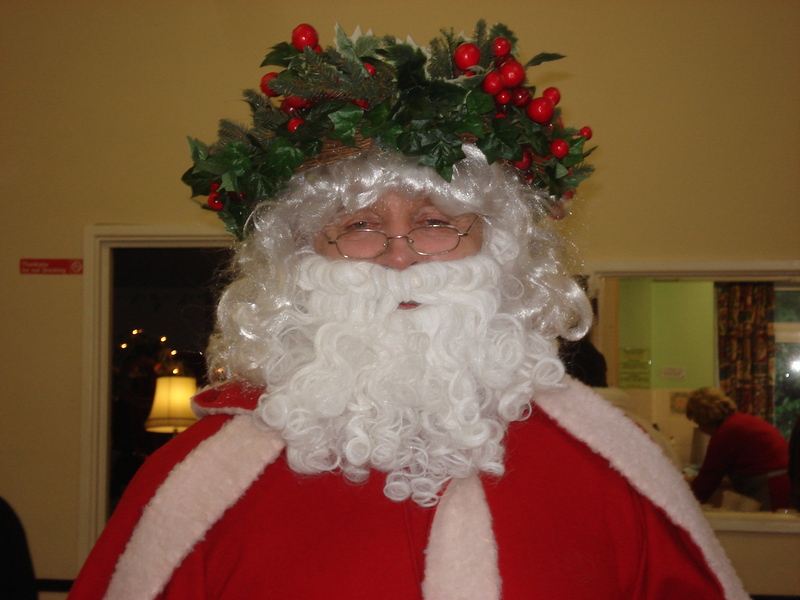 We set up this morning, then went back at 2pm to await the opening of the bazaar by Father Christmas!! We had a number of varied things to sell, from plates with poppies on, to scarves, old knives and forks, crockery, a hamper, jewellery bits and pieces to name but a few. 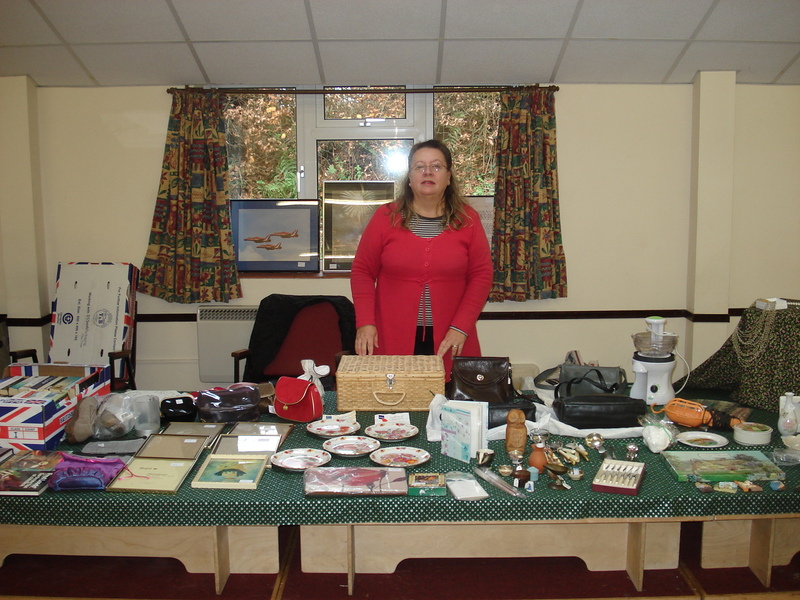 Here is Kathy at our stall. The weather wasn’t too bad today, dry and sunny but cold, but much better than this time last year when we had the first snow. 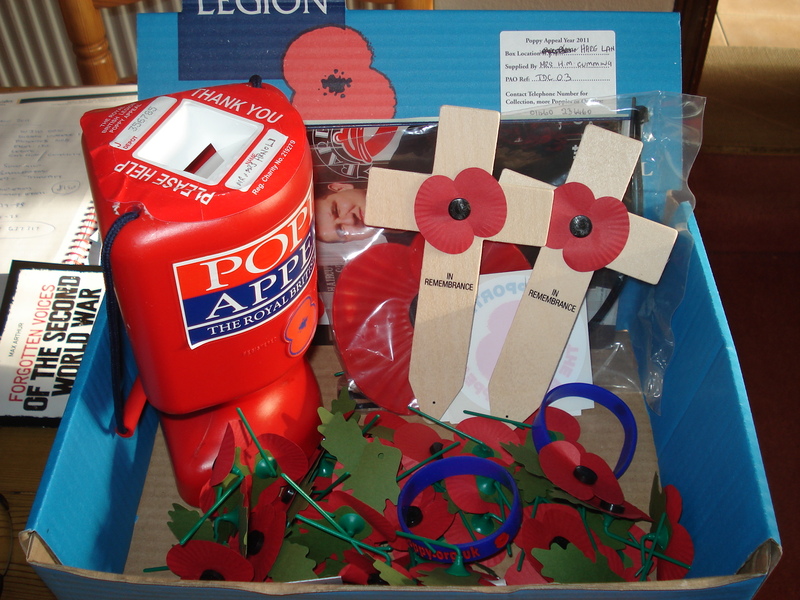 A good number of people turned out and we raised £62.80 selling stuff today, which wasn’t bad really. 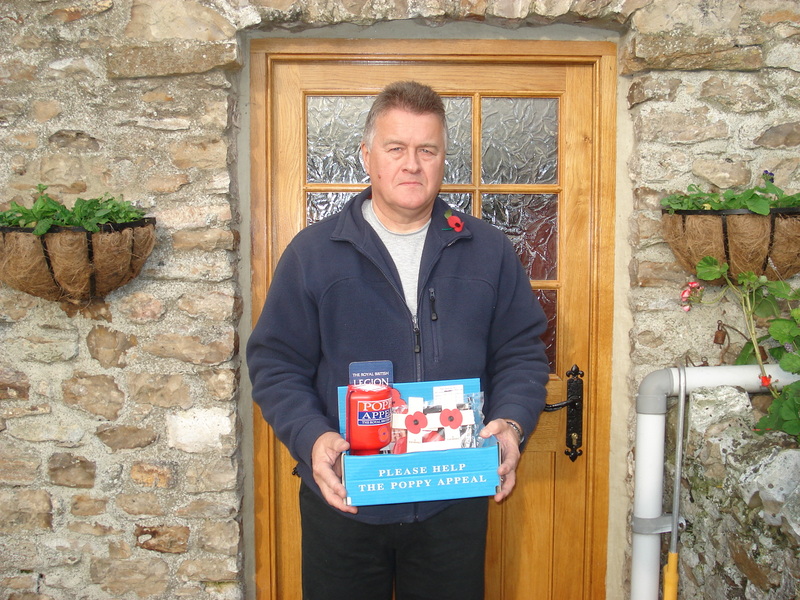 So there we are – rural life in the community of Buckland St Mary. 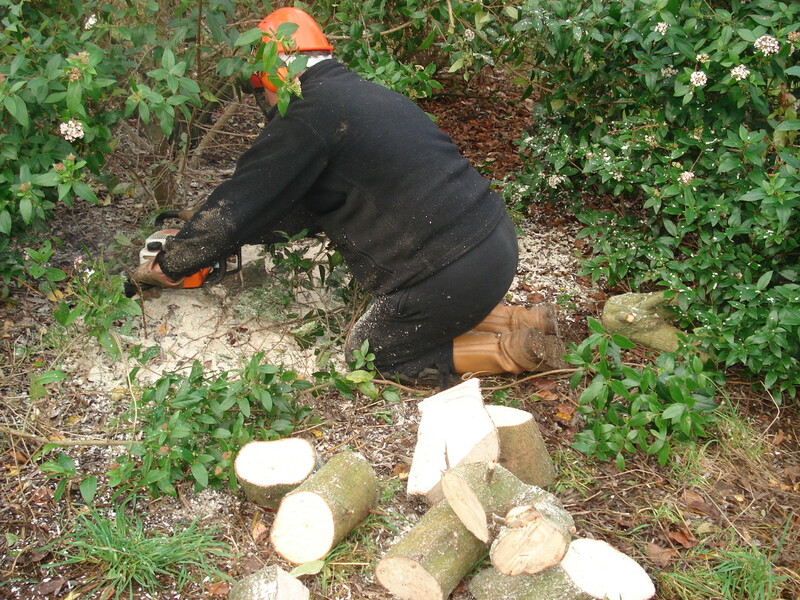 Today we have been woodcutting for friends. Our friends live in the next village Bishopswood, and have a thatched house, with no woodburning stove, so they have no use for all the wood from their trees. They also don’t have a chainsaw, so they asked Neil if he would mind coming to their place with his chainsaw and chopping up some tree trunks. They had already taken down some of the smaller stuff with a hand saw, but that is quite hard work when there is a lot to do. So Neil went up there first and got going on the tree trunks still in the ground. 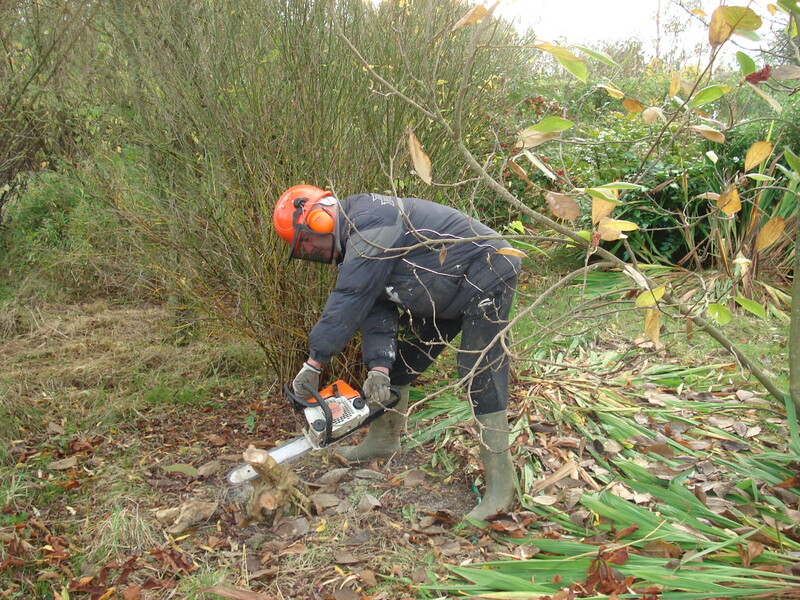 He also showed our friend how to safely use a chainsaw and he had a go too. I followed on in my car so I had an empty boot (trunk) to bring back some wood in. Us girls gathered up the chopped wood, and bagged it up. There were quite a few bags of it. It will be burning wood for next year, not this, as it has to season first and dry out a bit, so we will have to stack it all up at home and let the air get to it. 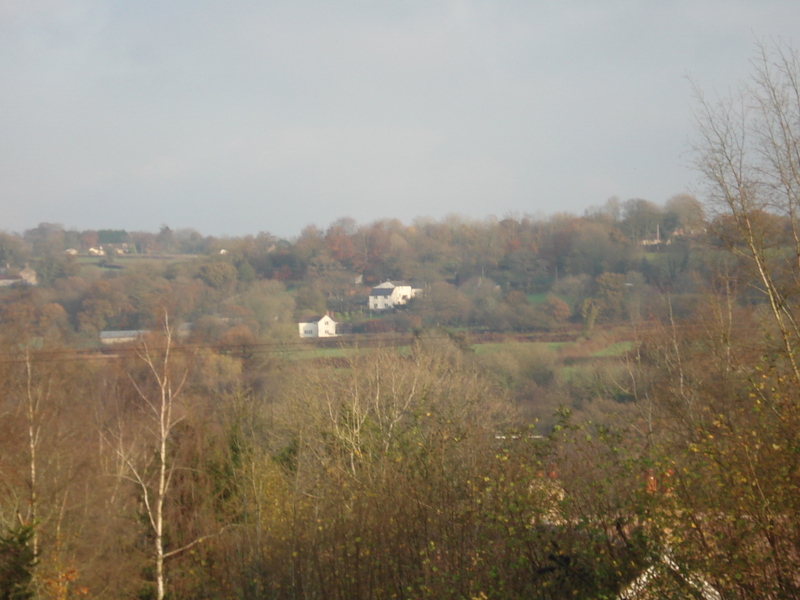 Whilst at our friends I spotted our house in the distance, the other side of the valley. Our house is the white one behind the house in front. Anyway it was a nice mild November day, with some watery sunshine today, so good for working outside.We helped our friends out and they gave us all the wood, so a good deal all round. The unseasonably warm weather this November has meant we have been able to carry on gardening althougththe ground is very wet due to all the rain we have had. Firstly we pulled up all the runner bean plants, weeded the bed and covered it with black weed suppression sheet. 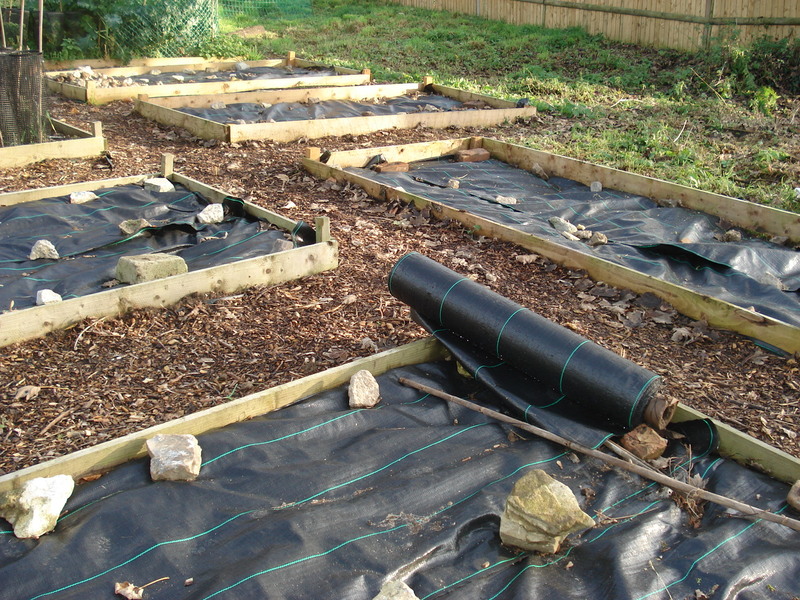 We have done this to a number of our vegetable beds once we have harvested all the produce, as this cuts down on the weeds and will give us a head start in the Spring, when we come to seed for the new season’s growth. 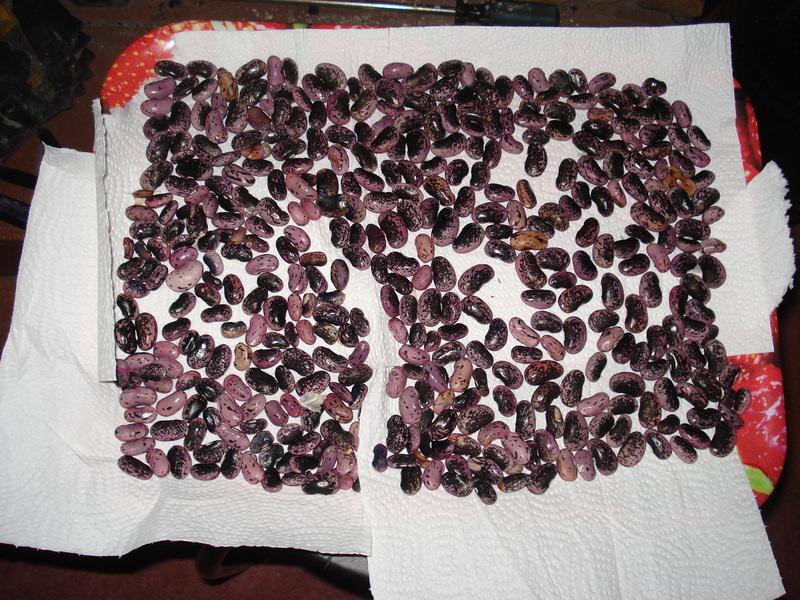 The remaining bean pods that we took down, we dried in front of the woodburning fire and took out all the seeds for next year. We have so many that I think we can start up in competition to Thomas and Morgan, – we could be Arnold and Arnold bean seed suppliers! We have pruned the Bramley apple tree and put all the trimmings through the wood chipper and then added all the chippings to the compost heap. We still have the magnolia tree in the back garden to do. 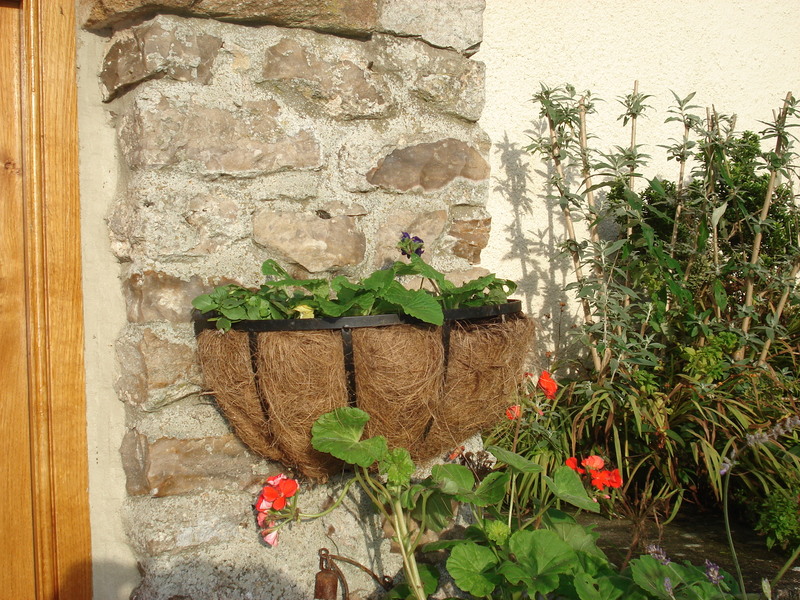 The hanging baskets were looking a bit sad, so we took them down and replanted the half moon baskets with spring bulbs, hyacinths, tete a tete narcissus, and crocus, then put pansies and polyanthus on the top to give some immediate colour. 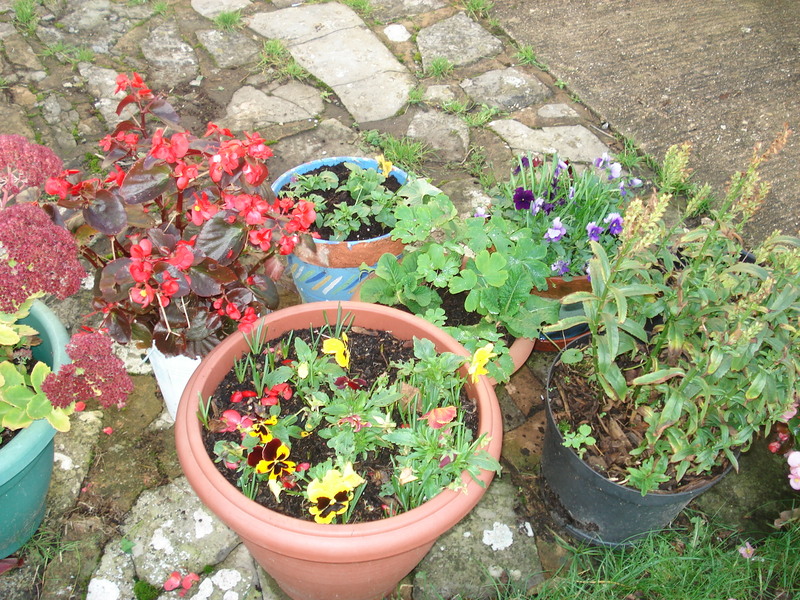 I’ve taken out all the dying bedding plants and replanted the pots with bulbs and pansies. The pansies are all in flower now and the bulbs are already pushing through. 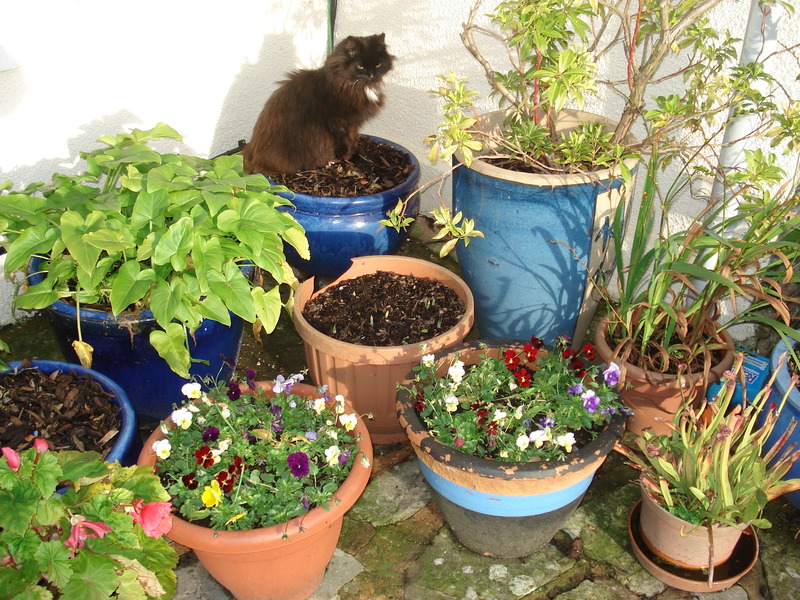 Tarquin our old black cat likes to sit on the empty pots. He got in on this picture. I still have a sack of daffodil bulbs to plant and wallflowers to put out, but the geraniums , godetia and begonias are still in flower in mid November, so it seems a shame to pull them up yet. We haven’t had any frost yet to kill them off like we would normally have had by this time of year. Neil has been strimming back the weeds in the paddock, and gave the lawns another and hopefully final cut today. 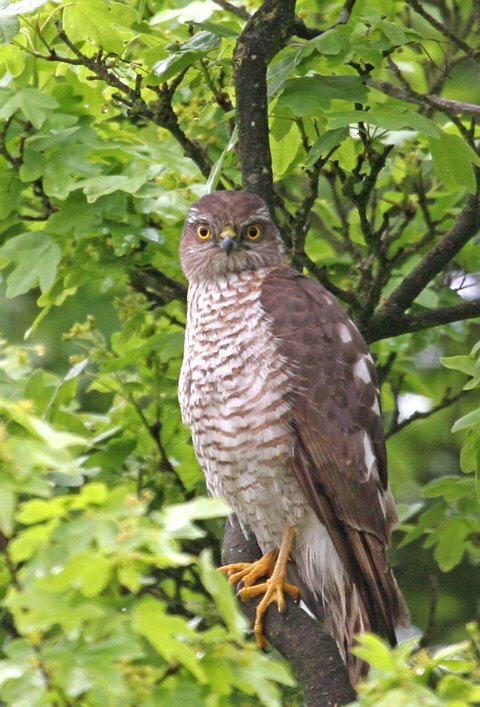 He wants to spend another couple of days in the woods, gathering fire wood for the Winter, but he also wants to create another couple of vegetable beds for this year, and the thinking is, if he does it now, whilst we have all the fresh top soil down, we can cover them up for the winter and stop the weeds growing. So the Autumn gardening continues.